Being a student you might be given the task to make an awareness poster or a poster presentation to create awareness about a social topic. This may include making a single or multiple slides that provide an infographic or sequential slide depicting a chain reaction, relationship between different variables or cause and effect illustrations. The easiest method to create a good poster presentation is to get a head start by using a suitable Poster Presentation Template. 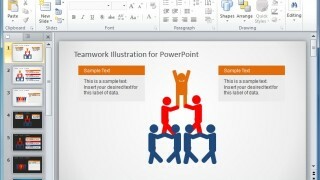 This is a PowerPoint Template with different illustrations related to teamwork that can be used for making presentations related to cooperation, team building, teamwork, mutual benefits, etc. 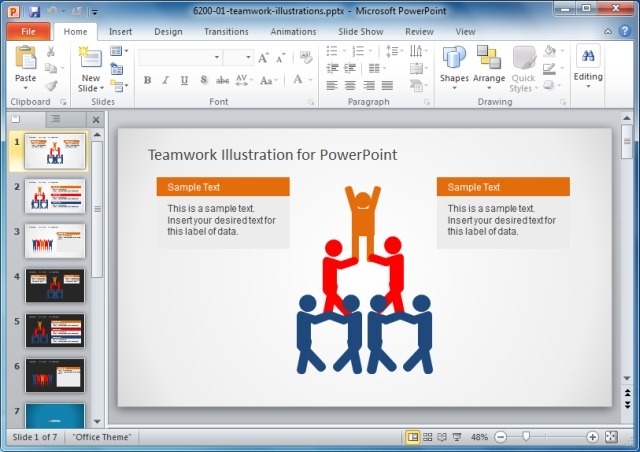 What makes this template ideal for poster presentations is the level of customization that it offers; as specific items (like the stick figures) can be easily moved around from one slide to another, to create a poster slide. This is another fine template for making poster presentations. It comes with slides that can be symbolic for teamwork, love, cooperation, peace and other topics that are often used in poster presentations. Voting, elections, democracy and freedom are topics that are quite commonly used in poster assignments and projects. The Ballot PowerPoint Template can be quite handy when making such projects or presentations. 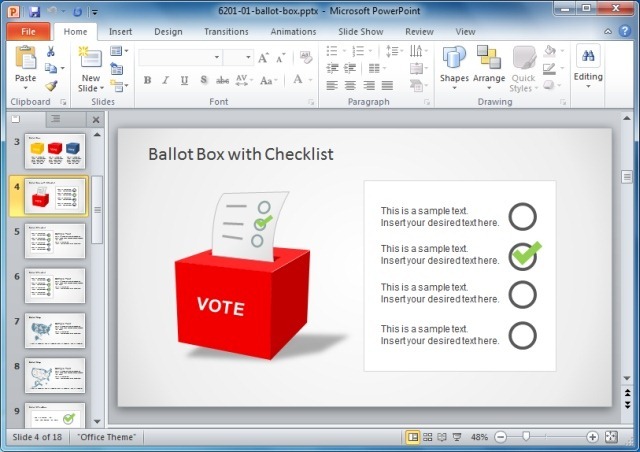 The template not only provides slides containing relevant images of ballot boxes and votes but also offers some very useful placeholders, clipart, maps and slide layouts that can help you fashion your slides quite conveniently. The sample slides can be used for making timelines, poster presentations, slides with geographical statistics, etc. 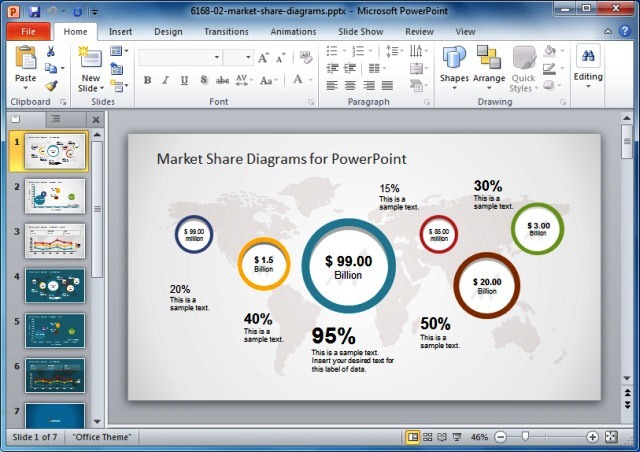 While this template has been originally designed for making business related presentations, however, it is flexible enough to be utilized for making infographics, poster presentations and other types of projects which may require showing statistical data with maps and charts. For example, if you are making a poster presentation on poverty, you can use this template to show the distribution of the poor around the world. 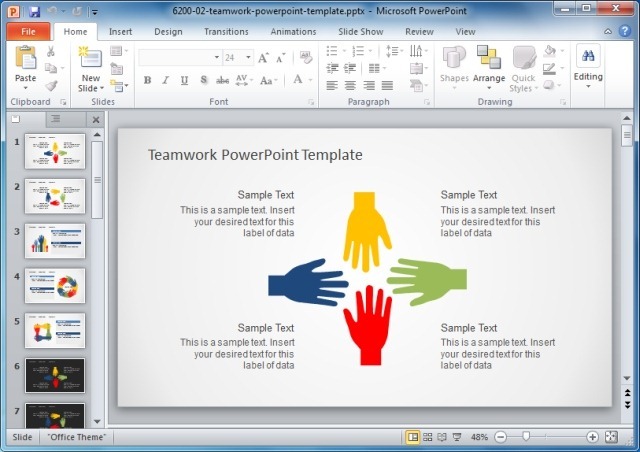 Similarly, the sample slides in this template can be customized to generate charts and diagrams related to your topic. Poster presentations about topics related to technology are one of the most difficult to make. This is because it can be hard to find relevant clipart, images and templates. 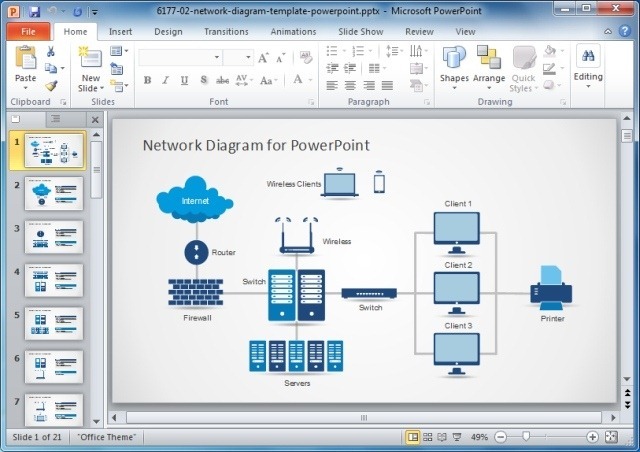 The Network Diagram Template For PowerPoint serves as a comprehensive toolkit for making presentations about technology, be it about network infrastructure, cloud computing, operating systems, advancements in technology or more generic topics like the impact of technology on the lives of people. When it comes to poster assignments, one of the most prized topics are related to the environment. This template serves as a nice resource for making poster assignments related to the environment and nature. 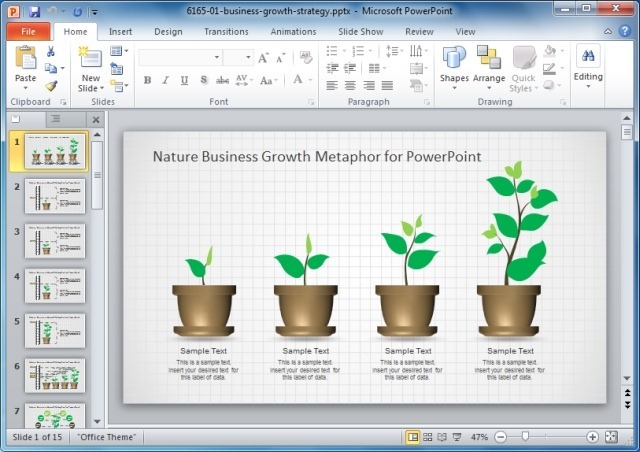 Furthermore, you can even use this template for other topics by using the growth of plants (shown in the template), as symbolic for business growth, economic growth, increase in quality of life, etc. While sometimes a single template may be enough to create a poster presentation, at other instances you may require blending elements from different slides to create a custom poster presentation. To make your job easy, browse through our gallery of Poster Presentation Templates to find one which may suit your topic. Tags: Chart Templates, Diagram Templates, Funnel Analysis PowerPoint Template, Map Templates, Poster Presentation Template, PowerPoint Shapes, Project Planning, Templates, Timelines.